Anyone interested in where I look for the best content about technology news may be surprised when I don’t start immediately listing Web sites I frequent. Since it’s so easy to post newsworthy information on a news blog, I’m hesitant to trust more than five or six different sites. Instead I look to Andrew Sorcini, Muhammad Saleem and Reg Saddler, better known as MrBabyMan, Msaleem and Zaibatsu from the world of social media. JD Rucker a.k.a. 0boy was the guest lead host along with Andy, who would chime in whilst doing some work on the side. Heavy hitters Lt. General Panda and Brainnovate also joined the show via Skype as well as whoever else was up for it. [Shameless plug: I join the conversation at about an hour and a half into the video, which can be viewed here.] For me it was the first time I’d heard many of these people talk about the stories they submit and share on a daily basis. The active social media users have always been sort of like very intense editors who are charged with submitting only the best content into their publications. And of course, I’m not talking about any extremely active social media user, just the handful of them that are at the top. 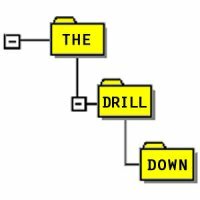 But regardless of what your stance is on active users, The Drill Down is definitely worth checking out. This entry was posted on Wednesday, February 4th, 2009 at 1:27 am and is filed under Social Media, Web Culture. You can follow any responses to this entry through the RSS 2.0 feed. You can leave a response, or trackback from your own site.